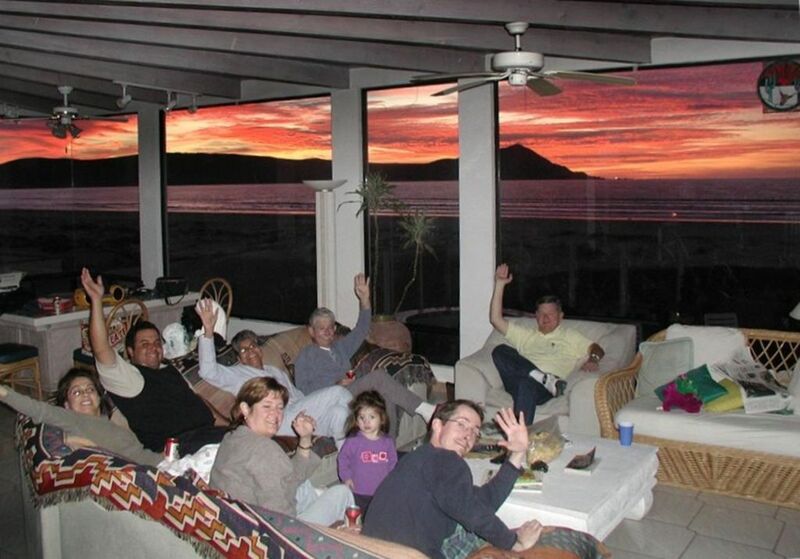 This magnificent, (approx) 4000 square foot home is located near the exciting seaport city of Ensenada. This wonderful home (five bedrooms, family room, sleeps up to 17 persons sits on one of the most beautiful, undisturbed, pristine, sandy beaches in all the world. It is located minutes from the famed 'La Bufadora' famous for snorkeling, diving, shopping, and one of the largest 'Blow Holes' in North America.' A four-season paradise for outdoor lovers, winter, snowbirds, and warm weather vacationers. Just a short distance from the house you'll find five-star restaurants (in Ensenada), duty-free shopping, surfing, sports fishing, the world's most shopped street, and one of the three most cloud-free areas on earth. It's a world of Mariachis, and salsa, exotic foods, culture, and it's practically in San Diego's backyard. So near, so easy, and yet so foreign. This home is wonderfully decorated, complete with rare tiles imported from Italy and the most unusual southwestern art. There is a downstairs family room for the children, with their own bathroom, TV/VCR, and game table. This home features some of the most majestic, panoramic ocean views in all the world. Enjoy a Margarita with your guests as you relax around the fabulous tiled sunken bar facing the blue Pacific! From there walk up to the incredible private deck (surrounded by water on all four sides) and ravage the awesome sunset! Time for dinner, move to the formal dining room and dine by candlelight while enjoying romantic music and the warmth of the fireplace. Romance is in the air, an ocean side fire pit in the patio, (great for roasting marshmallows and sing-a-longs), two fireplaces, a water view from all but one of the bedrooms, and some of the most breathtaking sunsets in all the world. This home is located in a private gated community at the Baja Beach And Tennis Club, with round the clock security. Just minutes away is tennis, golf, horseback riding, boating, snorkeling, fabulous diving, exceptional fishing, and a beautiful golf course. I am a professional photographer, travel the world shooting photos for my software company. The house was built in 1990 for my 5 daughters.some of my kids are in the photo. My wife is a flight attendant, the perks are really awesome. We have never seen a location such as ours in our travels that anything rivals our beachfront and is so private. This is by far one of the most beautiful areas in the world. Located on arguably the most amazing beach on the planet, no crowds, no loud tourists. Unlike many beaches in Northern Mexico when the tide is in there is no beach, just rocks--not here! just white pristine sand! A gated safe community with 24 hour aroung the clock security gives us peace of mind.So remote but just a half hour from the excitement of Ensenada. Also water sports, horseback riding, golf and tennis is minutes away. Our friends love to snorkle and scubba dive, the Bufadora is 10 minutes fron the house and arguably is one of the best areas in Northern Mexico to enjoy that sport. Quiet enjoyment, long walks on the beach, bird watching, The most amazing view from the living room and bedrooms that I have ever seen in all my years of traveling. The upstairs deck is surrounded on all side by water and with that 360 degree view of the ocean and bay I personally have never seen anything like it in my travels. The water is safe for my 5 daughters and their kids, the waves are gentle and the beach is very safe. This is paradise, the only problem with it is when I have to leave. Downtown Ensenada is 30 minutes from the house. Magnificent panoramic view of the ocean. This home is located right on the beach. Incredible panoramic of the beach and ocean. Once the wheel chair is carried up the front steps into the house there is a ramp within the house for easy access to the living areas.Please ask owner for details before comitting to rental. We had 10 people in our party from two families and there was plenty of room for all of us. The community is safe and the employees are more than helpful. We were able to launch our WaveRunner at high tide from the launch ramp by the restaurant. The home was spacious and clean. We spent the days playing on the beach and the nights by the fire pit or watching movies. We will definitely be back. Beautiful house and location, very responsive and friendly property managers. Overall, good experience! But we lost power, water and plumbing for 15 hours our last evening/night of the stay, which was difficult. We had a wonderful family vacation! We stayed in this wonderful home July 2018. We had a great time! The views from this home are spectacular. We sat on the rooftop patio every night and watched the sun set. We would most definitely return. Although we had a wonderful time, please know this is not a brand new, up-to-date home. It is well maintained for the most part, but not a five-star resort (as you can see from the pictures). The kitchen had everything we needed, although outdated. The five bedrooms were plenty spacious for our 4 adults and 5 kids. Unfortunately the beds were very uncomfortable. Alan said he is replacing the carpet in September, which will be nice. In a beach home with kids it did get a bit sandy, despite our best efforts. We didn't really need anything, but the one occasion we asked for bug spray it was brought to us quickly (we had a teeny-tiny and problem... no roaches or anything). The beach and sand dunes were absolutely amazing for our kids. The four younger ones (11, 11, 12, and 12) spent hours upon hours playing games out there. We strolled the beach daily combing for shells, which were in abundance. We felt totally safe. We had no problem letting the kids play outside minimally supervised. Just a note for yourself... as of the time of this writing the Web site associated with this home is out of date. There were no games, for example, and our kids didn't bring any because we thought we didn't need to. There are also no beach towels, which again we didn't bring. Some of the restaurants are gone; we couldn't contact the chef to come cook for us. We thought that would be fun one night. But that shouldn't deter you from staying here. We ate at El Rey Sol in Ensenada, suggested to us by Alan. It was absolutely delicious. It takes a good 30-45 minutes to get there without traffic, but worth it. We will return there on a future trip! Patty's restaurant around the corner was good, as was Mama Bear's Pizza. Thanks for opening up the house to us. Again, we loved our vacation! Showers had very low pressure and limited hot water. There was noisy construction happening next door. Nice house, but it's not really finished. Roof deck is incomplete. Surrounding area is pretty run down and abandoned. House is right on the beach which is nice and the price is good. Beach is beautiful and has amazing sand dunes right in front. 20 minute drive to town and about an hour to the wine valley. Wonderful view and location great for large families. Beautiful spacious relaxing house on the beach!! can't even tell you my husband and I absolutely loved this place. The view was incredible and the owner was the nicest person. He went above and beyond to make sure we would have a wonderful time here. It's spacious, romantic relaxing and a great location with the best view ever. My husband and I went paddle boarding right on the beach and also in the bay. We had the beach All to ourselves! My husband also went fishing and came home with some bass! You really get a bang for your buck. Not to mention the house is right on the beach. How on Gods great earth do you get a 5 bedroom house right on the beach for such a reasonable price. It's unheard of! I must say, my husband and I are form Orange County and we are very particular where we go but this place did not disappoint. I was very impressed and we will definitely be back!!! Thank you so much! Barbara thank you for your kind words. Yes we are a comfortable home on the ocean. We don't pretend to be a five star resort, we just want you to have the comforts of home. glad you and your husband enjoyed it. Minutes away visit the famous 'blowhole', one of the most powerful and highest natural geysers in North America.